I have totally been on a gift kick lately. I have several family member birthdays, Mother’s Day, and Teacher Appreciation in May; all good reasons to hunt around for fun little presents for people. If possible, I try to choose gifts that will work for many individuals, so I can mass produce or buy in bulk. I recently had coffee with a friend that I met through my children’s swim team. TheSwimFriend has been borrowing an embroidery machine and monogramming almost anything that will fit under the sewing machine foot. 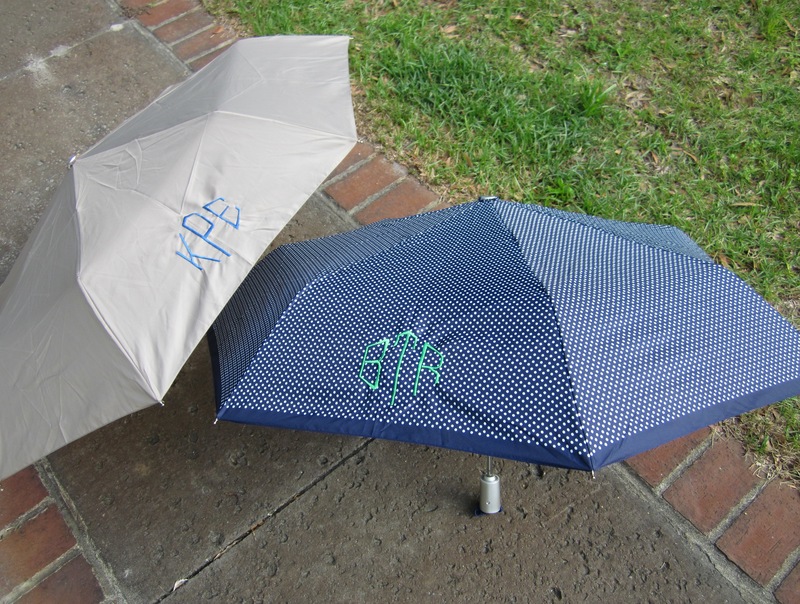 During coffee, she showed me a monogrammed umbrella. I had to have one (or five). After a quick trip to Target for travel sized umbrellas, I dropped off my purchases with TheSwimFriend who kindly mongrammed them for me. 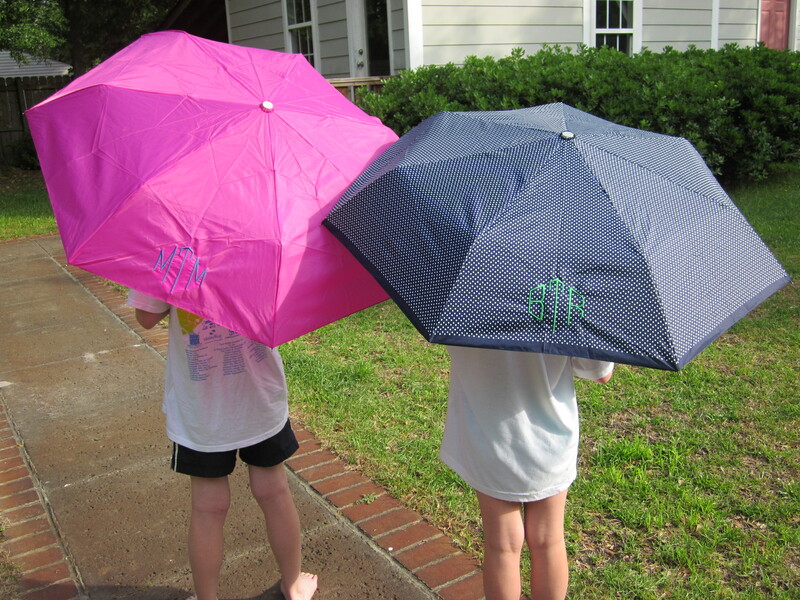 I am hoping USPS has already delivered TheRoomMomMom’s Mother’s Day umbrella, so I am not ruining the surprise. 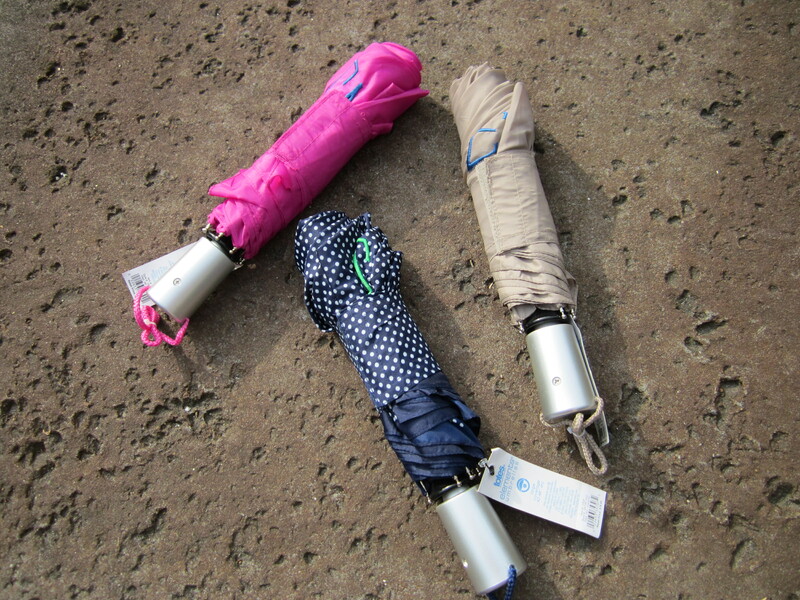 Since I used travel size, my mom can leave the umbrella in her car or stuff it in her purse on a rainy day. I had one made for Mr. Star Wars’ teacher for an end of the year gift because the teachers at school have to walk about two blocks from the parking lot to the school, rain or shine. The umbrella is just the right size for a teacher bag. I have a few more ready for upcoming birthday gifts. 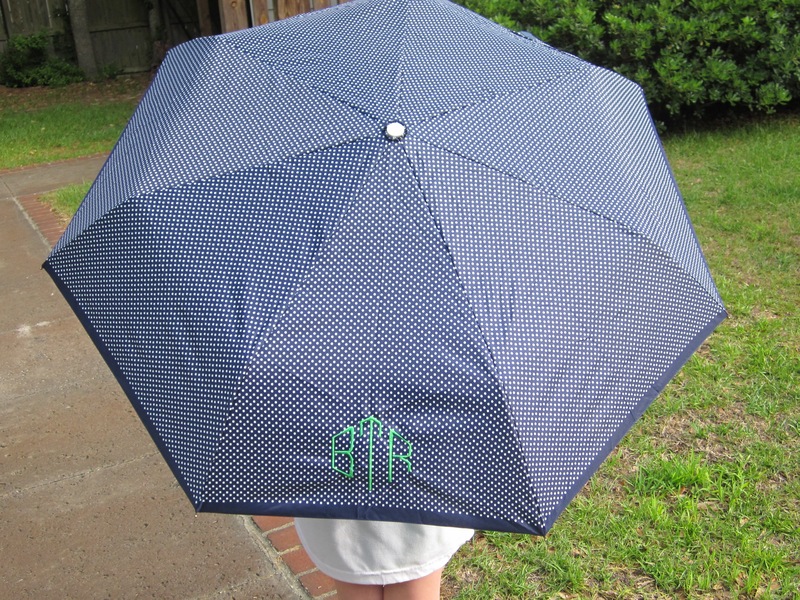 My favorite combination is the navy and white polka dot umbrella with the kelly green monogram. TheSwimFriend played around with the monogram size and liked 3 1/2″ tall at the center point. 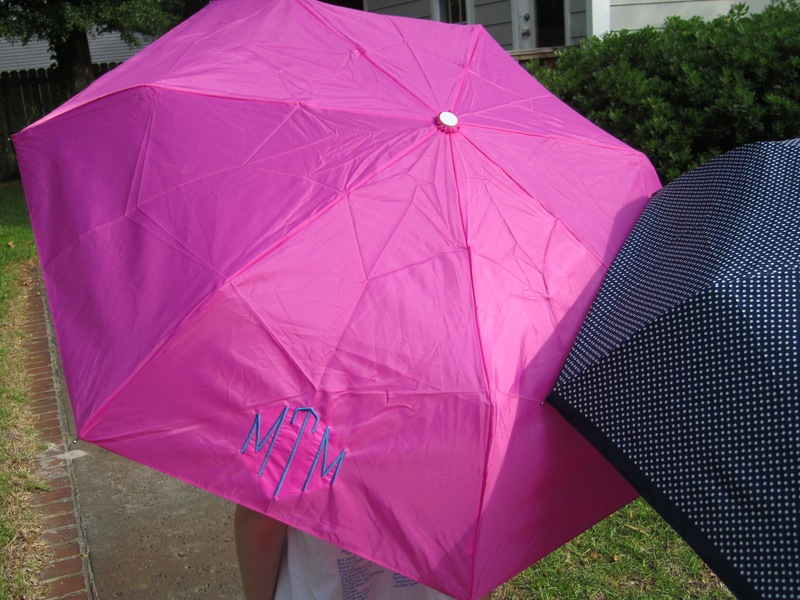 The monogram also needs to have stabilizer on the back in order to keep the umbrella material from puckering. My SwimFriend did this as a favor for me, and I would like to do something nice back. Any suggestions? TheSwimFriend has seen all of my recent gift ideas. Your umbrellas look darling. I want to embroider one for my daughter, what’s the best stabilizer to use? My friend sewed them for me, but I think she used a standard stabilizer you get at any fabric store. It was not interfacing and tore away after she finished. Something like this http://www.joann.com/pellon-ez-stitch-tear-away-stabilizer/10973584.html#sz=36&start=1.